The original purists let objects speak for themselves. The designs are characterised by simple forms. The AXOR Uno bathroom collection perfectly embodies this kind of purism. With mixers that are radically functional and minimalist in design. The steel pipe, the favoured material of the purists and at the same time the most original form of water transport, is key to the design: the cylindrical geometric elements are precisely put together. Within the rules of the Golden Ratio. Reduction is a characteristic feature of the innovative Select technology. This takes mixer operation back to basics: the mixer is operated using one single button. On and off at the touch of a button. Form and function. Perfection. AXOR Uno includes products for wash basins, showers and bath tubs in three creative configurations: with ergonomic bow-shaped handle, purist handle and a radically reduced zero handle. 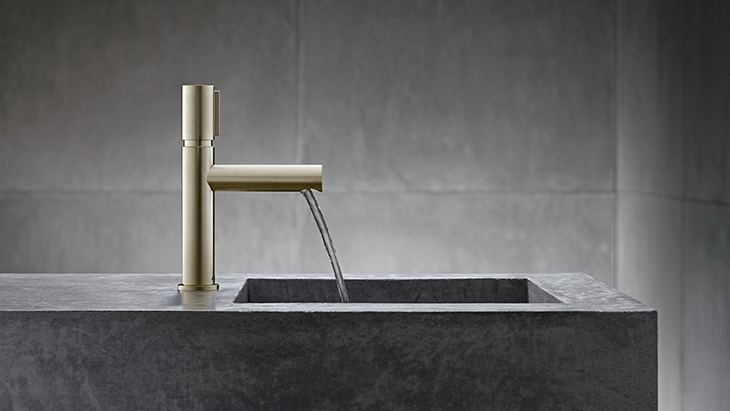 Add individual touches using finishes such as Brushed Nickel or Polished Brass, two of the fifteen special finishes available from AXOR FinishPlus. Two cylinders. Precisely put together at right angles: the ascetic form of the AXOR Uno mixers generates a special radiance. The purist design principle also features in the modes of operation: ranging from the ergonomic bow-shaped handle through to the zero handle. On basin mixers with Select technology, the mixer is turned on and off at the touch of a button. Choose from single lever basin mixers, three-hole mixers, wall, free-standing and electronic mixers. The purist pipework style from AXOR Uno is continued in the shower. An example: the AXOR Showerpipe 800 in the Polished Brass special finish. The two buttons on the thermostatic mixer control the hand and overhead shower via Select technology. The shelf, made of mirror glass, is elegant and discreetly integrated into the exposed thermostatic mixer. When the shower is turned on, the latest innovation in jet design is revealed: PowderRain, with its softly enveloping, silk-like droplets. Perfect in form and function. Also the perfect complement from AXOR Uno in the shower: the AXOR overhead shower 350 and the thermostatic mixer 800 for exposed/concealed installation. The purist standard when it comes to design and function. Implemented in the AXOR Uno bath mixers. For example, the three-hole rim-mounted bath mixer with bow-shaped handle. Gently curved, from the handle to the bath filler. Ergonomic perfection. Purism in its pure form. AXOR Uno for the bath tub: in the variants rim-mounted bath mixer, exposed or concealed mixer with separate bath filler and also floor-standing installation.